Apple has been quite vocal about being environmentally friendly for a while now and seems to truly strive towards a more environmentally-friendly production of its products — at the iPhone SE and iPad Pro 9.7 event back in March, the company proudly announced that its factories in the USA and China operate on 100% renewable energy, and that 99% of the products' packaging comes either from recycled paper or from sustainable forests. Now, it seems Cupertino is taking yet another step towards environment-conscious business. 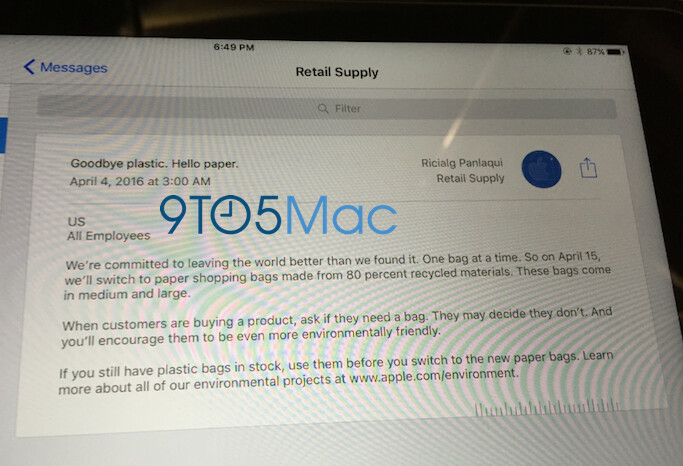 An internal memo has leaked, showing that, starting April the 15th, Apple stores will stop using the iconic plastic bags and will move to paper ones, bade with 80% recycled materials. On top of that, store staff has been instructed to ask customers if they will need a bag in the first place, giving them a choice to just carry their purchase, preserving a perfectly good bag unused. How big can the omission of simple plastic bags be? Quite big, really, especially for a company like Apple. It sells millions of products worldwide on a yearly basis. Each of these sales has thus far automatically been packed in one of the aforementioned, Apple-branded plastic bags, which are rather large and thick. That's millions of non biodegradable bags being handed out per year, with many of them undoubtedly ending up in the trash. So, good on Apple for taking responsibility and reducing its footprint further. nevr seen that b4 this lives only in usa right ..
and still people are taking pictures of screens in 2016.
https://youtu.be/NCOhtU7YSRw Let me know if you want a step by step guide. I'll write one for you. CLICKBAIT! PA Come one how is this news, looks like everything that Apple does is big news.........JEEEEZZZZZ! No the sand is in your eyes Fanboy! It's 2016 and Apple is now just doing this. So progressive. My local grocery store stopped using plastic bags over a decade ago. 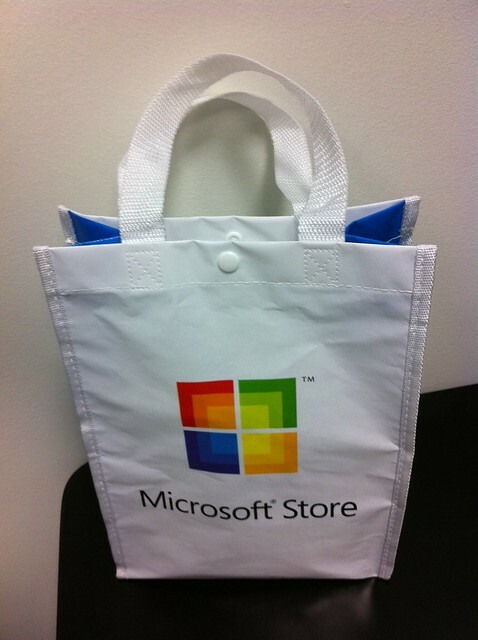 http://lmgtfy.com/?q=microsoft+ditches+plastic+bags Guess what comes up?